One reason some Americans look askance at boozy punch is because of some God-awful version they had in college. Bacardi and Kool-Aid, if they’re lucky; more likely, Tang and some off-brand distillery's 151 with some frozen limeade thrown in. But punch can and should be so much more than that. And we are quite partial to the rum variety. The world of rums is a complex and fascinating one; the spirits run the gamut between clean and dry (mixable almost like a vodka) to rich and aged with the barrel character of a whiskey. While all of these punches have a little fruit, we're not big fans of the "three juices and three rums" camp. All three of these recipes deliver tons of flavor, highlight the flavors of their respective rums, and make good use of lime and Angostura—a good rum’s best friends. Originating well over a century ago, the first recipe for Planter’s Punch was simple: dark rum, lime, Angostura, and grenadine. Indisputably, it's best with homemade grenadine, which is the simplest thing to make on the planet. And once you've made the grenadine, it takes about a minute to whip up punch. Thanks to good, funky Jamaican rum (we're using Appleton Estate) and the complexity of the grenadine, this punch tastes like it houses a variety of sophisticated fruit flavors, despite its few ingredients. We tested out this recipe, and within an hour were making it by the pitcher. Instructions: In a big cocktail shaker with ice, combine 8 ounces dark rum -- we highly recommend Appleton Estate Rare Blend 12 Year Old—4 ounces of freshly squeezed lime juice, 2 ounces of grenadine, and 8 dashes of Angostura. Shake that all up and strain into a pitcher with lots of ice. (A big shaker should just be able to handle all this. Alternatively, do it in two batches; or make it a frozen punch and run everything a blender.) Serve with four glasses and garnish with lime wheels. 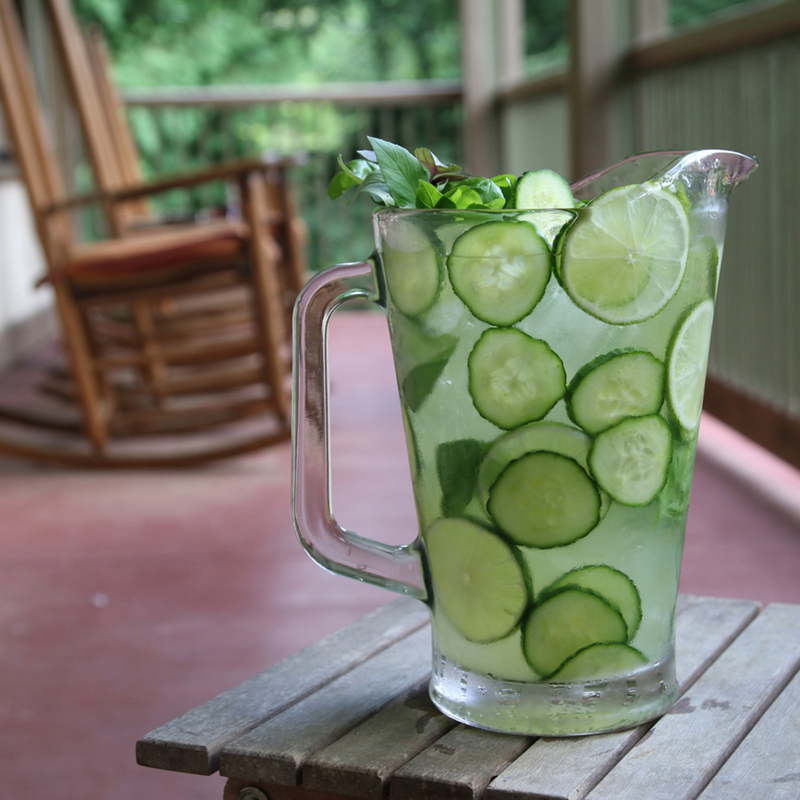 Basil, cucumber, lime; what's not to love? Whereas the Planter's shows off the depth and funk of Jamaican rum, this punch features a super-dry white rum—we're using Brugal Extra Dry—whose clarity lets the fun summer flavors shine through. Instructions: In a big cocktail shaker, muddle 12 thin slices of cucumber. Add ice plus 8 ounces light rum (we’re using Brugal Extra Dry), 3 ounces of freshly squeezed lime juice, 2 ounces of simple syrup, and 12 basil leaves. Again, if you don’t have a shaker big enough, do this in two batches. Shake that all up and double-strain (through your cocktail's own strainer, and the fine mesh strainer) into a pitcher with lots of ice. Serve with four glasses and garnish with lime wheels, basil and cucumber slices. On trips to Thailand, we find ourselves drinking a ton of the local rum, which marries well with the local herbs and spices. So we're pairing rum with citrus, lemongrass, and Kaffir lime leaves for a punch that's all Southeast Asia in flavor. As with all good rum punches, you should be able to imagine yourself on a hammock by the beach with one of these in hand. Instructions: Cut yourself two three-inch stalks of lemongrass, and slice them finely. Add that to a big cocktail shaker along with four torn-up kaffir lime leaves, and muddle. Add ice plus 8 ounces rum (Mount Gay is our choice here as local Thai can be hard to come by in these parts) plus 2 ounces of freshly squeezed lime juice, 2 ounces of freshly squeezed lemon, 3 ounces of demerara syrup (simple syrup, made with demerara sugar), and 4 dashes of Angostura. Shake that all up and double-strain (through your cocktail's own strainer, and the fine mesh strainer) into a pitcher with lots of ice. Serve with four glasses and garnish with more lemongrass and Kaffir lime.